Justice and granting felons the right to vote will be hot topics at this year’s SGA Community Address. On November 20, 2017 at 11:00 AM in the University Center Theater at LSU-Shreveport, the Student Government Association at LSUS will be hosting a Community Address. College is a an environment where thoughts are challenged, perspectives come from all directions, and people from all walks of life enter the pathways of higher education to learn how to survive and thrive in the world around them. At this year’s town hall the SGA is proud to present Curtis Davis. Davis is president, Shreveport chapter, of the Louisiana-based organization VOTE, and he is currently pursuing a degree in criminal justice at Southern University Shreveport, LA. 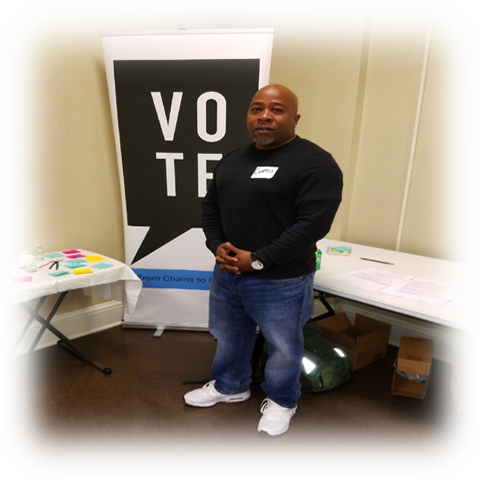 VOTE is a non-profit organization that pushes for the reinstatement of certain civil rights that are taken away from those who are convicted on felonies in Louisiana. Many rights are taken away, but the right to vote being taken is arguably the dearest in a democratic republic. Davis is not foreign to speaking with passion and intellect for crowds of all types, including speaking to a class of students at Loyola University’s school of law regarding the 4th Amendment. What makes his speaking at forums even more captivating, is the fact that Davis served 26 years in the Louisiana State Penitentiary system due to a wrongful conviction and was released last year. “Understanding that our country is leading the pack in the sheer number of citizen’s it incarcerates compared to other industrialized nations is disheartening” said Jarrett “Prince” Lofton Vice President of the Student Government Association at LSUS. “In Louisiana, prisons have seemingly flourished while higher education has been cut continually. I am proud to be born and raised in the state of Louisiana; however, I am not proud to say that Louisiana, per capita, locks away more citizens than any other place in the world. Those that are released from prison cells are brought into mainstream society and deemed ‘untouchables’ by the number of barriers placed on their ability to get housing, government aid, and higher education. Many politicians see them as non-factors because they can’t vote. With our governor and some of the legislators of our state taking a smarter approach to crime with the bills passed in the ‘Justice Reinvestment Act’, I think this conversations time has come. I just want to do my part as a leader on my campus and help ensure that these conversations are heard by young ears as well.” This event is open to the public. It will be of interest to anyone concerned about criminal reform issues. Davis will discuss justice in Louisiana currently and historically, criminal policies in Louisiana and their implicit messages, and why felons should have the right to vote immediately after their release. This event is free and open to the public. There will also be time allocated toward the end of the town hall for Q&A. If you would like to help support this public event contact Jarrett “Prince” Lofton, Vice-President of the Student Government Association at LSUS (LoftonJ04@lsus.edu).